On the bright side, heavy ammo synths now available. 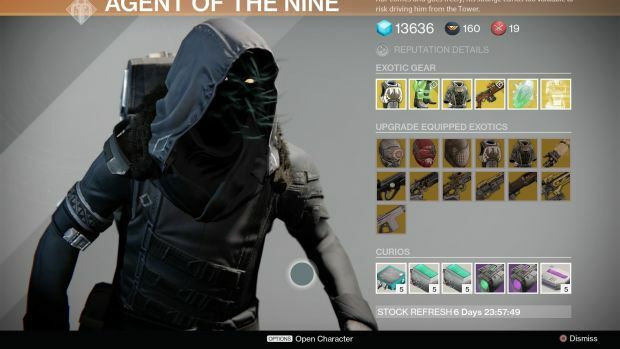 Destiny’s Exotic merchant Xur has returned to the Tower once more, carrying a mixture of happiness and broken dreams. You can find him in the Hall of Guardians, next to the Crucible Quartermaster where he’ll remain until February 22nd, 1 AM PST. This week, Xur is carrying the horrible Exotic sniper rifle No Land Beyond which can be yours for 17 Strange Coins. Alternatively, you can invest in the Crest of Alpha Lupi (Exotic Titan chest), Radiant Dance Machines (Exotic Hunter boots) and Voidfang Vestments (Exotic Warlock chest), each retailing for 13 Strange Coins. Exotic chest engrams are also being sold for 23 Motes of Light a piece. The good news is that Xur is selling Heavy Ammo Synthesis this week, with one Strange Coin allowing you to pick up five packs. Get ’em while they’re hot – who knows when Xur will be selling them again. Head here for the full list of Exotic upgrades. Keep in mind that you’ll need an Exotic Shard and 7000 to 8000 Glimmer to upgrade an Exotic.